With a new 20.8-megapixel sensor and a faster processor, the Nikon J5 takes an astonishing leap in quality -- we recommend it wholeheartedly. The Nikon 1 J-series of mirrorless cameras started off well, with the J1 earning our Recommended award when we reviewed it in 2011. 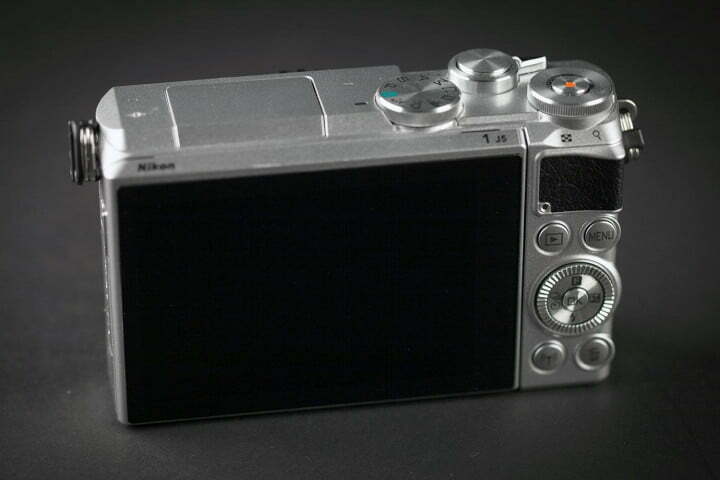 Nikon lost momentum over time, however; subsequent models were OK (including the S- and V-series), but by the time the J4 arrived, it failed to wow us considering stronger models from competitors. With the new J5, Nikon has dramatically improved its latest mirrorless camera by adding a new 20.8-megapixel sensor and a faster processor. The quality jump is so great that this is the first Nikon 1 camera we’d recommend wholeheartedly, especially if you want to capture fast-moving subjects. Nikon did a 360 on design for the newest entry in the J series: Whereas the J4 looks futuristic, the J5 resembles a retro rangefinder, but the exterior belies a fairly advanced 2015 digital camera. It’s compact and, with the 10-30mm f/3.5-5.6 VR kit lens attached, we had no trouble carrying it around all day. The J5 body measures 3.9 × 2.4 × 1.3 inches (smaller than an iPhone 5S in terms of height and width) and weighs around 11 ounces (with battery and card). Our review sample was black and silver, but white and brown bodies are also available. 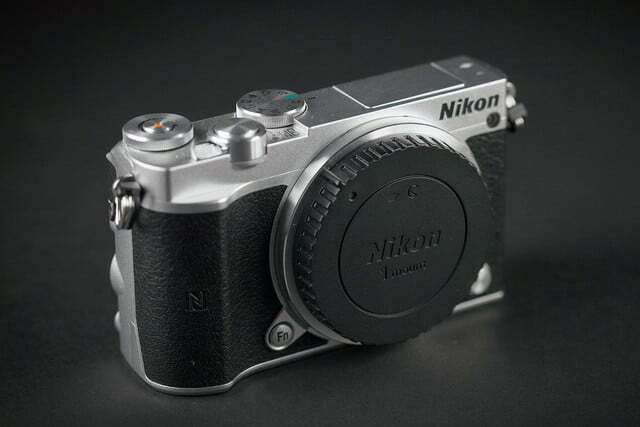 The key feature on the front is the Nikon 1 mount. 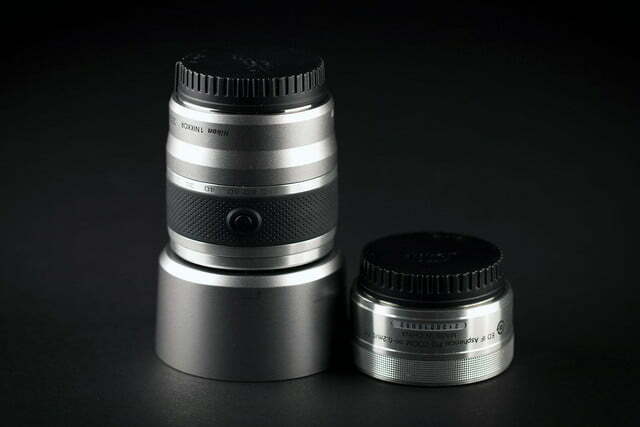 The company has 13 interchangeable lens options covering a variety of focal lengths. Along with the 10-30mm lens, our kit came with the 30-110mm f/3.8-5.6 VR zoom, and Nikon provided us with a fine $900 32mm f/1.2 prime to play with. The Nikon 1 has a 2.7× crop factor (read more about that here), so there was a nice overall focal range and the prime equaled a traditional portrait lens. 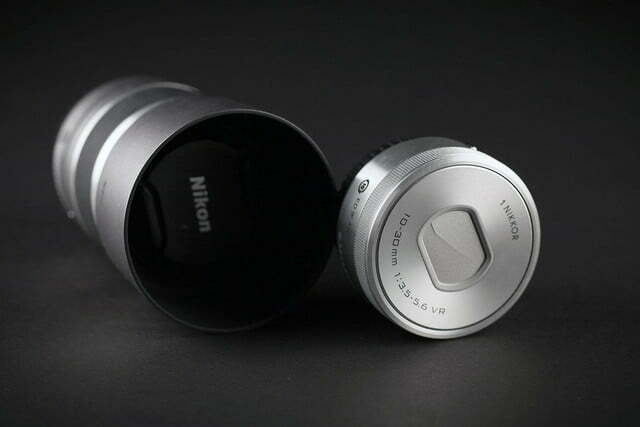 Note: The Nikon 1 cameras use different lenses than Nikon’s DSLRs, but you can attach a Nikon F-mount lens via an adapter. Rounding out our tour of the front is an AF Assist lamp for focusing in low light, as well as Function and lens-release buttons and an NFC (near-field communication) tag on the grip. 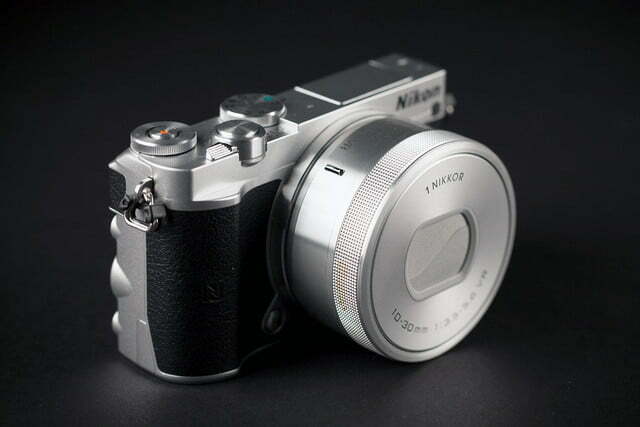 Thanks to a new sensor, Nikon has dramatically improved its latest mirrorless camera. Nikon added a convenient jog dial for camera/menu adjustments, with a red-dot button in the center for recording videos. 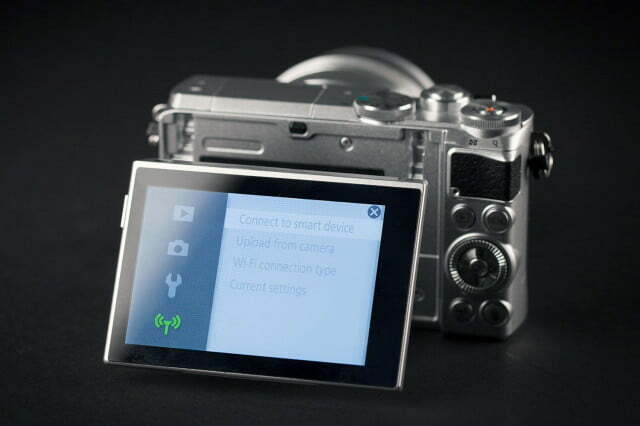 Nearby are stereo mics, a built-in flash, a classic mode dial, and a shutter button/power lever. The built-in flash is a real plus compared to other mirrorless cameras that use add-ons that attach via the hot shoe, like Samsung’s NX500. 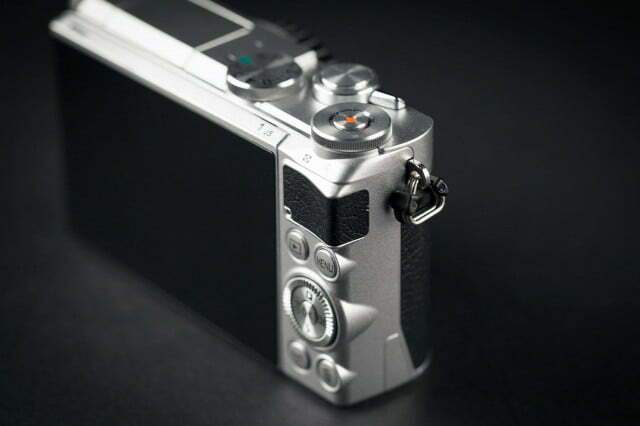 But because of the built-in flash, the J5 doesn’t have a hot shoe, so there’s no way to add an optional mic, stronger flash, or electronic viewfinder (EVF). Whether those accessories are important depends on the user; we like the convenience of an EVF, for example, an option that isn’t available. The back is dominated by a 3-inch touchscreen (rated 1,037K dots). It’s a good one, and we had few issues with wipeout or reflectivity once we cranked up the display brightness. Given the world’s propensity for self-portraits, the LCD flips 180-degrees for selfies. With the touch-focus enabled, capturing smiling faces is quite simple. To the right of the screen are a comfortable thumb rest and the usual buttons and keys for navigation and function. It’s a little tight, but pressing them with a fingernail gets you there. On the bottom is the battery compartment and MicroSD card slot. We’ve never been fans of tiny MicroSD cards for cameras (hard to handle, easy to lose), but since the J5 is so small, something had to give. Also a downer: The battery is rated only 250 shots compared to 350-plus for other admittedly larger mirrorless cameras. If you plan to be away from an outlet, a handy spare is highly recommended. We tested a two-lens kit that includes a 10-30mm and 30-110mm lens ($750). Nikon also offers two one-lens kits: one with the 10-30mm lens ($500) and another with the 10-100mm f/4-5.6 VR all-in-one zoom ($1,050). Those are MSRPs, so definitely shop around. The carton also contains a rechargeable battery with plug-in charger, strap, USB cable, 140-page user’s manual, and other documents. Nikon offers a standard one-year warranty (to be free from defects in material and workmanship). The J5 is a turnaround. 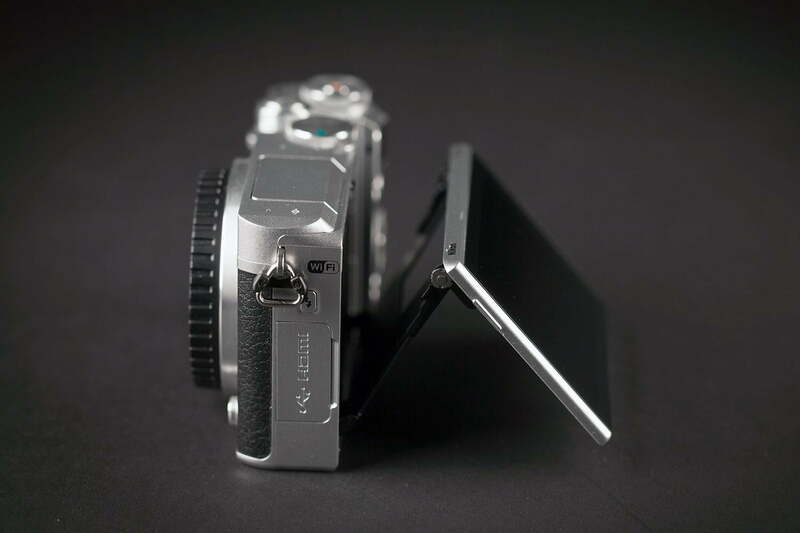 It isn’t just a rehash of the previous model, but a camera that looks, feels, and performs differently – better. And starting at $500, it’s an interchangeable lens camera (ILC) kit we’d be happy to recommend to first-time ILC buyers or anybody who wants a compact camera. One of the key improvements is a new 20.8MP backside-illuminated (BSI) chip combined with a faster Expeed 5A processor. BSI sensors offer improved performance in low light. 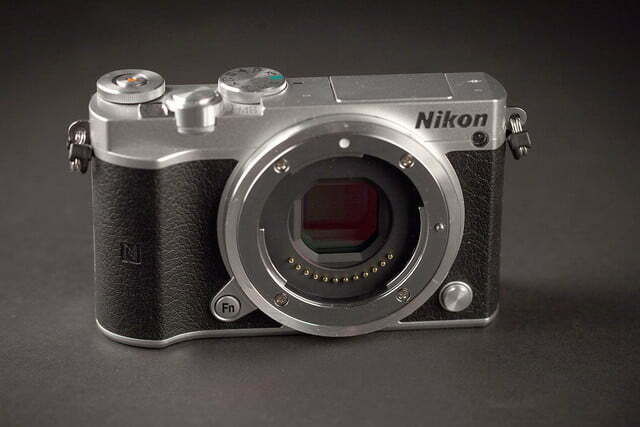 Realize the Nikon 1 uses much smaller sensors (13.2 × 8.8mm) versus 24 × 16mm APS-C chips of many competitors, and this is one of the reasons we were disappointed by previous Nikon 1 models. 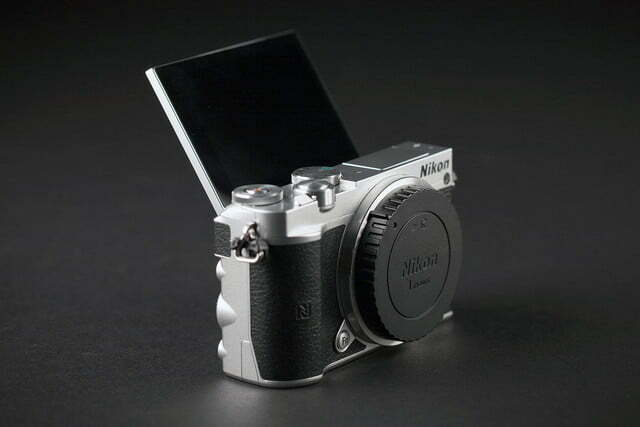 Nikon engineers knew they had to make a move to remain in the mirrorless race, hence the improved sensor. 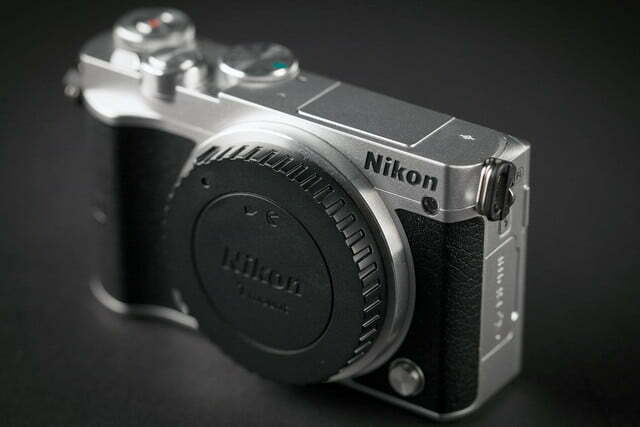 And by adding the new processor in combination with hybrid autofocusing, the engineers created a camera that can capture fast action at 20 frames per second – faster than any DSLR, Nikon claims. We took that pronouncement with two grains of salt when we heard it but after seeing the results, we were floored. The J5 really does it, keeping the subject in focus during a burst. Nikon claims the J5’s burst mode is faster than a DSLR – it’s true. But as with all good things, there’s a caveat: The camera grabs 20 images, and then stops to save files to the card; it literally stops at the end of the burst and you’ll have to wait 10 seconds or so before you can shoot again. We found this a bit annoying but when we saw the results, it lessens the sting. By comparison, the Nikon D7200 DSLR shoots a slower 6 frames per second, but it takes 100-plus JPEGs before slowing down. That said, the J5 is pretty amazing. 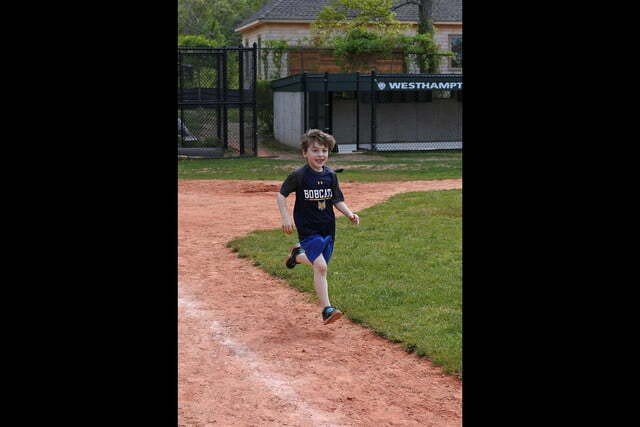 We captured a young boy racing toward first base and all 20 shots were in focus for the most part. This makes the J5 perfect for young families with frenetic kids (are there any other kind?) or for photographers looking to capture fast action. We used the J5 over the course of several weeks shooting a wide variety of still and moving subjects. 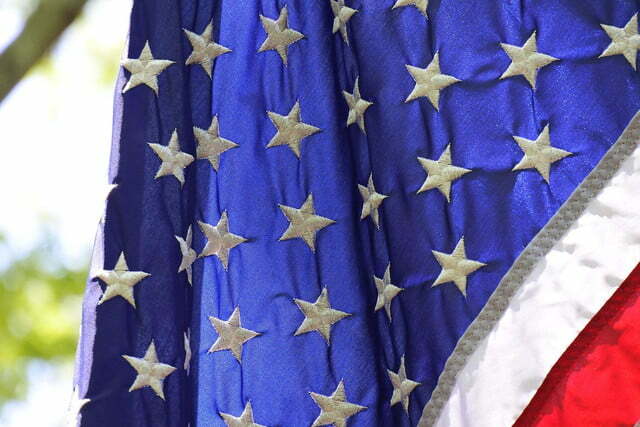 The results were really good with very realistic colors, especially if you get to use a prime lens like we did. Granted they don’t have the richness and depth of APS-C images when viewed at 50 percent or full size, but most people, particularly the J5’s intended user, won’t do that. 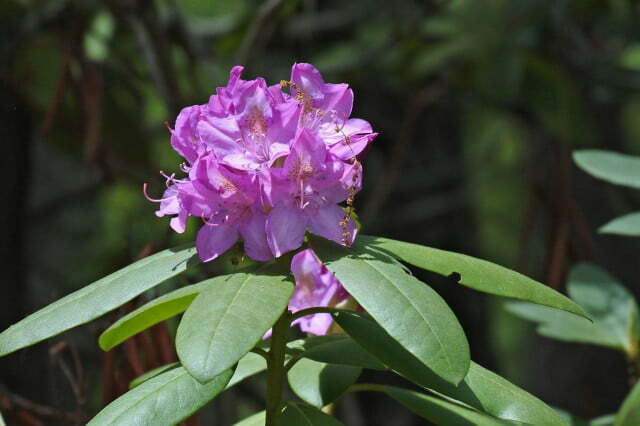 We were especially pleased with images taken outdoors and, thanks to the BSI imager, interior shots were also good. Overall, the J5 is a breeze to operate. 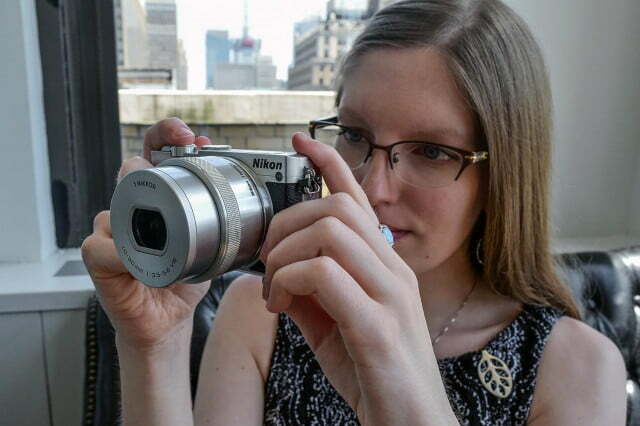 Given the small size, there aren’t a zillion buttons and levers — it’s more point-and-shoot than DSLR, in a sense. The main mode dial offers Smart Auto, PASM, Best Moment Capture, Motion Snapshot, Advanced Movie, and Creative (special effects including HDR, as well as five scene modes), plus Sports to shoot 10 fps on the fly. The touchscreen is quite handy too: Tap “F” on the back and you can change a variety of parameters just by tapping the screen. The Function button on the front is set for ISO as a default. The J5 has an ISO range of 160-12,800, a bit less than other mirrorless cameras that hit 25,600. That said, the BSI chip worked well up to ISO 3,200, and even 6,400 is usable at small sizes. We suggest avoiding the 6,400 NR option since it softens images way too much. 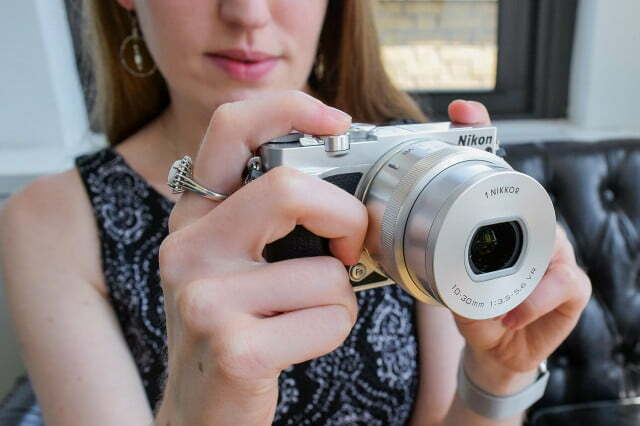 For a small camera with a small chip, it’s a good ISO performer. Another positive is the Hybrid Autofocus system. The system consists of 171 focus areas with the 105 in the center using phase detection, the remainder being contrast detect. What’s important for readers to know is that we rarely had any issues locking focus. Also helping to capture fast action is a top shutter speed of 1/16,000th of a second (electronic not mechanical). A distinct negative was battery life. The battery is rated 250 shots but our real-world test found it to be a bit less. This isn’t a problem if you can charge it somewhere during the day. 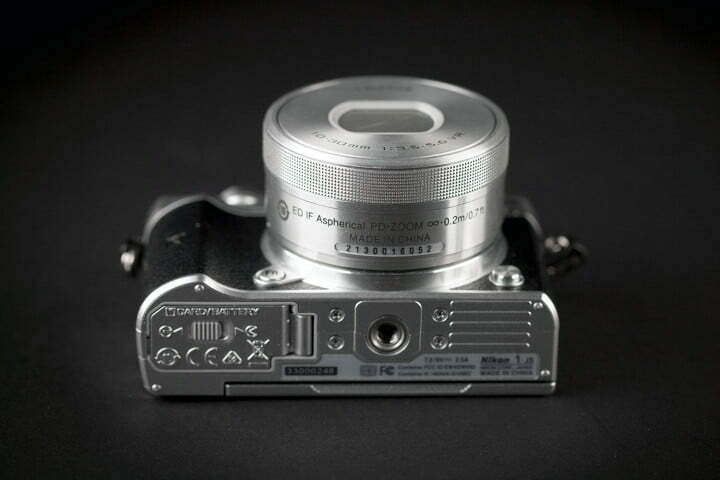 If you buy this camera, however, a spare power pack is a worthwhile investment, for around $40. Along with 5,568 × 3,712-pixel stills, the J5 takes Full HD 1080/60p videos. Nikon also dipped its toes into the 4K waters by adding 3,840 × 2,160-pixel H.264 .MOV videos at 15 fps. This isn’t in the same league as the 4K-capable cameras from Samsung and Panasonic, but it’s a start. We should expect higher quality in the years ahead from Nikon and other companies as 4K becomes mainstream. In the meantime, it gives the opportunity to experiment. Overall the movies were merely OK. The camera didn’t handle focusing as accurate as with stills. Another issue was a lot of shake since the J5 uses only electronic image stabilization rather than the optical IS built into the lenses. 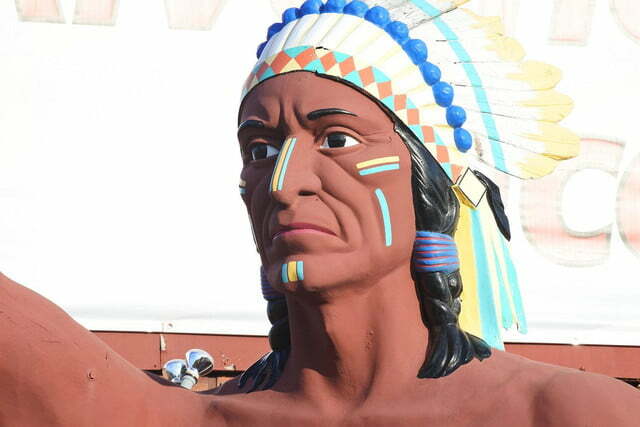 It’s a disappointment but you can’t have everything for $500. A steady hand and good light will yield acceptable results. The J5 has built-in Wi-Fi and NFC connectivity. 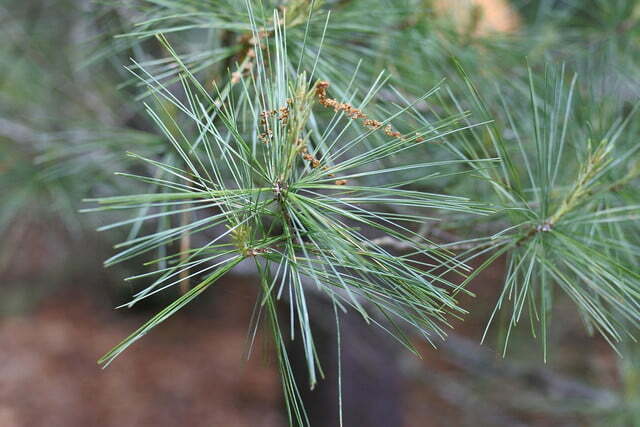 We had no issues connecting the camera using the Nikon Wireless Mobile Utility app (WMU) to a Samsung Galaxy S5 using both options. Once paired you can send images between devices, then use your smartphone to share images via email or social network du jour. The app offers rudimentary remote control if the camera is mounted to a tripod, using the phone as a viewfinder and controller; exposure compensation is the only setting you can change other than snapping the shutter. It would be really nice if more camera companies embraced wireless rather than treating it as a necessary evil — they could take cues from Samsung, Sony, or even GoPro. 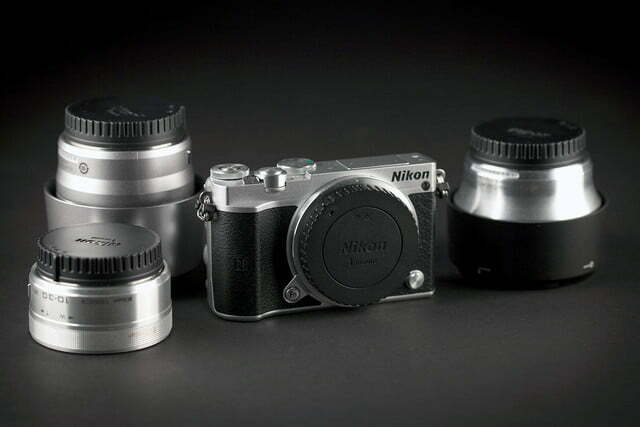 A great prime lens like the 1 Nikkor 32mm would make a nice addition to this kit. Because the J5’s battery has less charge than we would like, we recommend packing a spare. To help with performance, use a high-speed, high-capacity memory card. Note that the J5 uses MicroSD cards – 16GB minimum, but more is better. 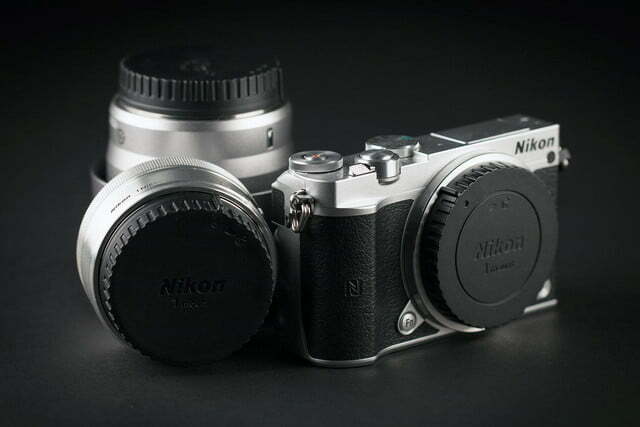 Finally, Nikon has a proper mirrorless camera that can go against competing entry-level mirrorless models. 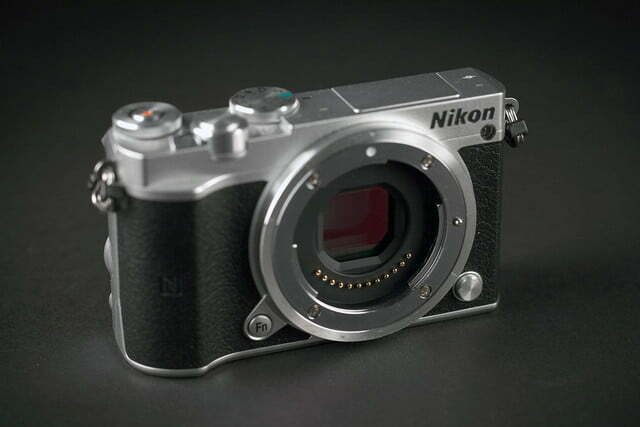 As we mentioned, the Nikon 1 cameras aren’t bad, it’s just the competition was getting stronger – fast. 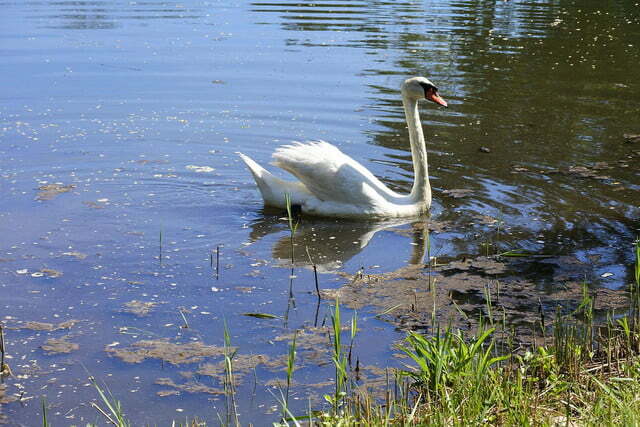 There are few reservations, but the pros outweigh the cons, and we enjoyed our time with it. If you’re looking for a small travel camera, definitely keep this one in mind. For $500 that includes a decent 10-30mm VR 3x zoom, this is a really good deal. Stills are solid, and that 20-fps burst mode is impressive.